Citation Information: J Clin Invest. 2007;117(4):919-930. https://doi.org/10.1172/JCI30328. This study illustrates that Plekhm1 is an essential protein for bone resorption, as loss-of-function mutations were found to underlie the osteopetrotic phenotype of the incisors absent rat as well as an intermediate type of human osteopetrosis. Electron and confocal microscopic analysis demonstrated that monocytes from a patient homozygous for the mutation differentiated into osteoclasts normally, but when cultured on dentine discs, the osteoclasts failed to form ruffled borders and showed little evidence of bone resorption. The presence of both RUN and pleckstrin homology domains suggests that Plekhm1 may be linked to small GTPase signaling. We found that Plekhm1 colocalized with Rab7 to late endosomal/lysosomal vesicles in HEK293 and osteoclast-like cells, an effect that was dependent on the prenylation of Rab7. In conclusion, we believe PLEKHM1 to be a novel gene implicated in the development of osteopetrosis, with a putative critical function in vesicular transport in the osteoclast. The Plekhm1 gene and protein. 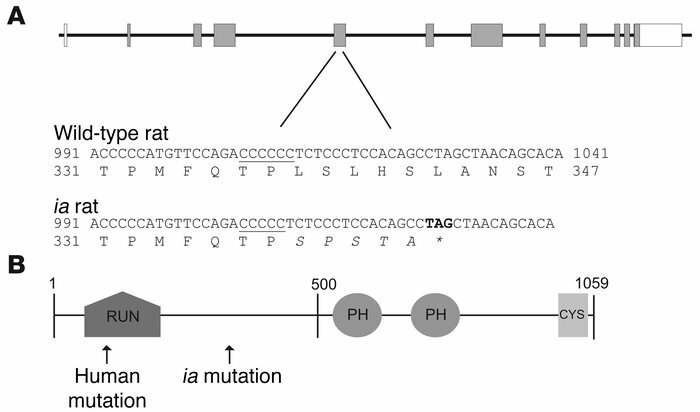 (A) Genomic structure of the rat plekhm1 gene and the ia mutation. The plekhm1 gene consists of 12 exons (boxes) with the start codon located in exon 2. In ia rats, 1 cytosine (located in a stretch of 6 cytosines, underlined) is deleted in exon 5 of the plekhm1 gene. This results in a frameshift mutation followed by 5 divergent amino acids and a stop codon (asterisk). (B) Domain structure of the Plekhm1 protein. The Plekhm1 protein consists of a RUN domain, 2 PH domains, and a cysteine-rich (CYS) domain. The positions of the ia and human mutations are indicated.